There was a time when the station wagon was the model of choice for families, but times have changed. These days, the crossover SUV is often looked to as an ideal choice that perfectly blends a roomy interior, higher ride height and impressive fuel economy. For active families, it truly is an ideal. Even for those who simply prefer space to stretch their legs and bring along their outdoor gear, the 2018 Nissan Rogue is a tempting vehicle. 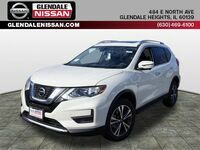 Available here at Glendale Nissan of Glendale Heights IL, there’s plenty to love about the Nissan Rogue. So, what makes the 2018 Nissan Rogue different from previous model years? Standard smartphone connectivity now includes NissanConnect with Apple CarPlay and Android Auto. These popular platforms are sought after by many tech-savvy motorists as they provide an intuitive interface that reflects the screens many of us are already accustomed to: those of our smartphones. Cleaned up to include only necessary apps, but otherwise similar functionality. Sometimes, simpler is better. Which is why the 2018 Nissan Rogue is offered in a simple hierarchy of just three trim levels. It all starts with the S, which comes with standard LED taillights and DRLs, UV-reducing solar glass, a 7-inch touchscreen monitor, Siri Eyes Free, Bluetooth, a rearview monitor, manual air conditioning, power windows and locks, and cruise control. The SV sits as a mid-level trim, with highlights that include dual-zone automatic temperature control, a motion activated liftgate, intelligent auto headlights, roof rails and Nissan Intelligent Key with push-button ignition. Topping your options for the 2018 Nissan Rogue is the SL, which includes Nissan Door-to-Door Navigation, Intelligent Cruise Control, automatic emergency braking with pedestrian detection and leather appointed seats. The 2018 Nissan Rogue has a 2.5-liter 4-cylinder engine that’s paired with the Xtronic CVT. Total system output sits at a maximum 170 horsepower and 175 pound-feet of torque, while still offering an EPA-estimated 26 city and 33 highway mpg rating. Thinking the 2018 Nissan Rogue might be your top choice? Stop by Glendale Nissan for a test drive. Interested in a Nissan Rogue?